CompanyCam and DroneDeploy announce integration. DroneDeploy platform with CompanyCam integration. CompanyCam, the complete photo solution for contractors, recently announced an integration with DroneDeploy, a drone software company with the largest drone data platform in the world. Through the DroneDeploy app market, CompanyCam users can activate the CompanyCam platform and upload plan data and individual images from the flight directly to projects in CompanyCam. 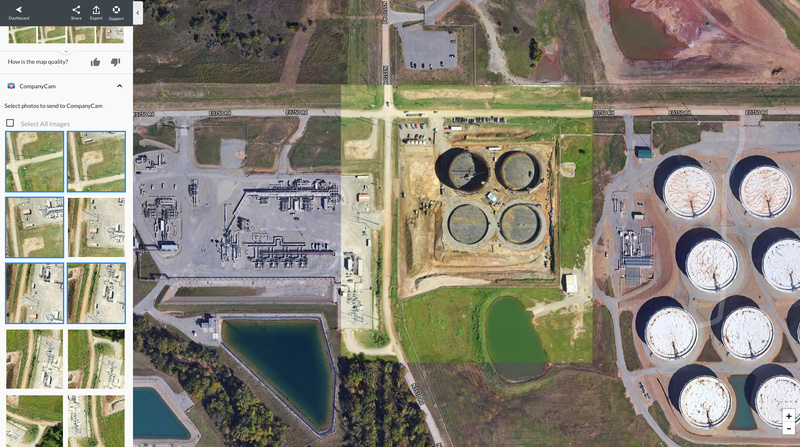 By combining the CompanyCam GPS tagging and DroneDeploy flight data, users of either platform can seamlessly import their drone photos into the correct CompanyCam project. “We are very excited to have CompanyCam as a DroneDeploy App Market partner. The integration between both platforms will deliver seamless workflows for our key construction customers and help them more effectively document job-sites and increase productivity.” said Nicolas Guerra-Mondragon, Business Development Manager at DroneDeploy. CompanyCam can be found in the DroneDeploy app market. Existing CompanyCam users can install the app through DroneDeploy, log in, and have instant access to the platform and all CompanyCam projects. About CompanyCam: Founded in 2015, CompanyCam has changed how contractors work. Through its complete photo solution, which allows companies to take unlimited photos—all of which are location and time stamped, sent to the cloud, and stored securely—CompanyCam allows contractors of any kind to manage and monitor projects from anywhere. With over 25M photos in the cloud and counting, CompanyCam is dedicated to providing contractors with the easiest and most productive photo solution. For more information, visit CompanyCam.com. About DroneDeploy: DroneDeploy is the leading cloud software platform for commercial drones, and is making the power of aerial data accessible and productive for everyone. Trusted by leading brands globally, DroneDeploy is transforming the way businesses leverage drones and aerial data across industries, including agriculture, construction, mining, inspection and surveying. Simple by design, DroneDeploy enables professional-grade imagery and analysis, 3D modeling and more from any drone on any device. To learn more visit http://www.dronedeploy.com and join the conversation on Twitter @DroneDeploy.